If you’re a healthcare risk manager in the US, managing data breaches will cost you significantly more than in any other industry in any other country. The per capita cost of a data breach will reach US$380 on average. Across all industries, the US is the costliest place in the world to suffer a breach: the average loss runs at US$7.35m. 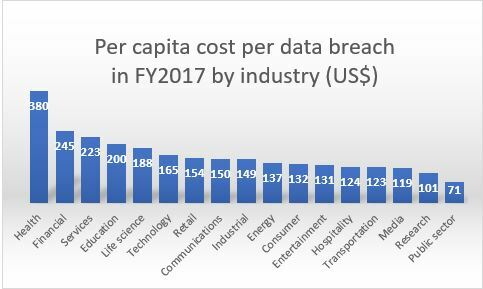 On the other hand, if you’re a public sector risk manager in India, the per capita cost of a data breach won’t set you back more than US$70 on average. The good news, according to the study by data protection research firm Ponemon, is that, overall, organisations across the world are handling data breaches more efficiently: the average cost of a data breach globally decreased by 10% in FY2017, to US$3.62m. Yet despite this progress, data breaches still lead to significant losses in the form of direct costs, loss of business and reputational damage. How much of a loss depends on where you find yourself on the map. Notifying all relevant stakeholders in the event of a breach is most expensive in the US, where tasks like curating contact lists, determining regulatory requirements and setting up communications cost an average of nearly US$700,000. In India, those same tasks set you back a mere US$20,000. Canada spends more money detecting a breach than any other country in the study. Forensic investigations, audit services and crisis management activities totalled an average of US$1.46m per breach, while similar efforts in Brazil cost less than a third that amount. 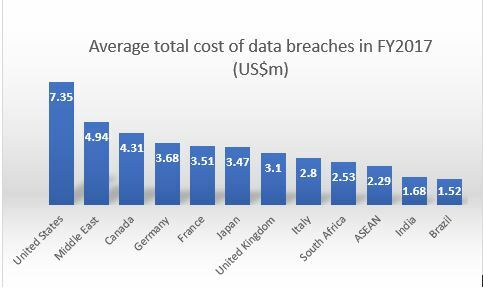 Of the 11 countries included in the study, Germany, France, Australia, and the UK do a better job of reducing the costs of data breaches than the US, Middle East (Saudi Arabia and UAE), and Japan. The study also revealed that heavily-regulated industries like healthcare, financial services, and education suffered costlier breaches than any others in FY2017. On average, the global per capita data breach cost was US$141, but breaches in transportation, media, research, and public sector industries averaged much lower price tags. Certain industries are much more vulnerable to customer loss in the wake of breach, which is a key factor in determining the overall cost of a breach. The financial and health industries lost an average of over five percent of customers after a data breach in FY2017 – well above the global average (3.2 percent). On the other hand, public sector breaches resulted in a zero percent loss of customers. 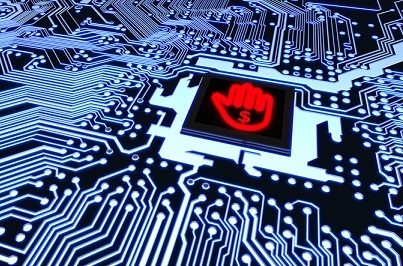 The cost of breaches in financial, technology, and health industries are on the rise. Topping the list with an average increase of US$45 in per capita cost compared to the four-year average, the services industry is one to watch, especially for businesses with operations in the US.